Being a birder is a heartfelt passion, so imagine the despair of backyard bird lovers when squirrels constantly foil their efforts to attract a variety of feathered friends. Squirrel proof bird feeder plans are quite easy these days, as innovation has created some amazing squirrel deterrent bird feeders. The best squirrel proof bird feeder pole we have found after comparing to numerous other designs is the is the Squirrel-Stopper Pole from Liberty Products. If you already have an existing bird feeder pole, you may be able to squirrel-proof it by simply attaching a squirrel baffle. Birds can easily get through the metal cage to get the seeds, however the openings are way too small for squirrels to get through. The diameter of the cage is large enough that squirrels cannot reach in to get the seed or tip the bird feeder trying to maneuver the seed out. 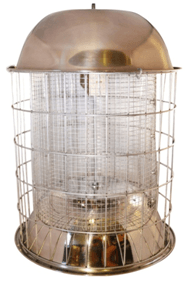 This nice squirrel-proof caged bird feeder is made of durable coated metal screen. The Esschert Design FB178 Squirrel Proof Bird Feeder measures over six-inch in diameter and 14-inch high and is very easy to fill. Available at Amazon. 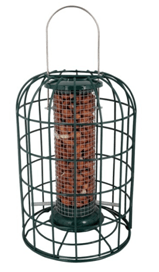 Best Squirrel Proof Bird Feeder - Heavy-Duty Repellent Cage Design - #1 Rated By Bird Lovers! 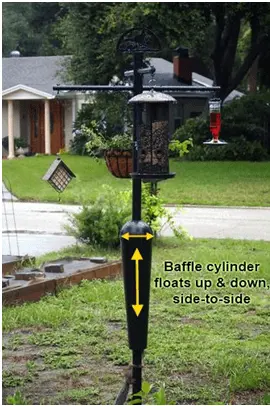 The Skinny Squirrel proof bird feeder is an elaborate, beautiful stainless steel that acts as a severe squirrel repellent by twisting so many layers into the design, squirrels get exhausted from trying to get at the seeds. This feeder home easily attracts a wide variety of the most popular clinging & perching birds including Woodpeckers, Cardinals, Blue Jays, Goldfinches, Titmouse, Blackbirds, Bluebirds, Chickadees, Doves, Finches, Grackles, Hummingbirds, Mockingbirds, Orioles, Robins, & Warblers. This intricate design was actually developed by a small family of bird lovers who needed a solution to the squirrel problem. This is rated the best resistant feeder by bird enthusiasts. Get it now at Amazon. 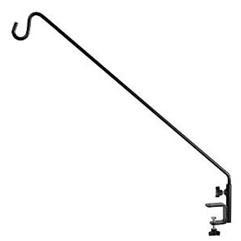 This is a multi-purpose extended reach deck hook. It can beautify your outdoor living space by hanging bird feeders, suet baskets, planters, flower pots, lanterns, holiday decorations, string lights, wind chimes, ornaments, and more! It is rust resistant, and made of a heavy duty steel construction. Yet it is the smart design we like. It allows you to position your feeder so seeds and bird droppings fall away from the deck preventing constant cleanup up messes. You can easily refill feeders by simply loosening the swivel and turning the hook back towards you. The 37 inch long pole makes it difficult for squirrels to reach the bird seeds. Squirrels seem to shy away from extended reach deck hooks, perhaps giving up after only a few attempts. These hooks seem to work very well and are an inexpensive approach to keeping squirrels out of your favorite bird feeders. GrayBunny Products are Premium quality steel that is rust resistant and durable provides for a long lasting product. Designed by the brightest minds, utilizing only the highest quality materials and expert manufacturing methodologies, you can buy it on Amazon.